Astronomers say they’ve found what could be another large planet on the fringes of our solar system. The researchers were examining the Alpha Centauri star system, the nearest to Earth, with the Atacama Large Millimeter/submillimeter Array (ALMA) when they noticed a fast-moving object crossing their field of view. Based on the speed and brightness, the astronomers believe the object is somewhere between 10 billion and 2 trillion miles from Earth. Studies announcing the discovery of this so-called “Planet X” candidate, as well as another object, were submitted to Astronomy & Astrophysics, but as the astronomers waited to hear back they uploaded both papers on December 10 to arXiv, a public online database of preprint papers. The papers were later made private. The ALMA is a group of radio dishes perched in the desert in the Chilean Andes, at a high altitude. While looking for new discoveries outside of our solar system, the astronomers believe they stumbled upon the massive new object. “Unless there are yet unknown, but significant, issues with ALMA observations, we have detected a previously unknown objects [sic] in our solar system,” the authors wrote. The object, named Gna, was seen in the Alpha Centuari star system. 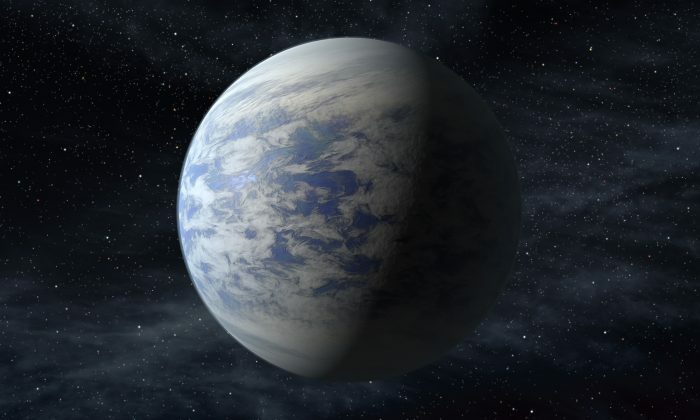 The authors believe it’s a small, icy Trans Neptunian Object, a Super Earth, or a brown dwarf. A brown dwarf is an object too big to be a true planet but too small to be a star. “Simple arguments convince us that this object cannot be an ordinary star. We argue that the object is most likely part of the solar system, in prograde motion, albeit at a distance too far to be detectable at other wavelengths,” the authors wrote. There’s already been a lot of skepticism over the discoveries. “It’s a considerable stretch to make the claim of an outer solar system object at this stage,” Jonathan McDowell, an astronomer with the Harvard-Smithsonian Center for Astrophysics, told Gizmodo. But even critics have had to admit the discovery might be legitimate. “The idea that there might be large planets lurking in the outer solar system is perfectly plausible,” wrote Mike Brown, a California Institute of Technology astronomer, on Twitter. Astrophysicist Brian Koberlein noted that the only way to make sure is further study.